Ours is a prominent entity involved in providing credible Oracle Certifications. All these Certifications of Oracle are among the most sought after badges of high reliability for expertise in the Information Technology marketplace. The OCJP certification Training is in a great demand in the entire IT industry area. It has become a global standard for many successful IT companies. These Oracle certifications covers diverse aspects of Database administration, Programming and Development, Oracle Middleware, Oracle Applications-Functional, Oracle Apps DBA/Technical, Business Intelligence, Oracle Golden Gate, Data Warehousing, Oracle Cloud, Application Express (Apex). These certifications are handled by well experienced and skilled professionals. Oracle Database is the premier database developed for enterprise grid computing, the most flexible and cost efficient way to manage information and applications. 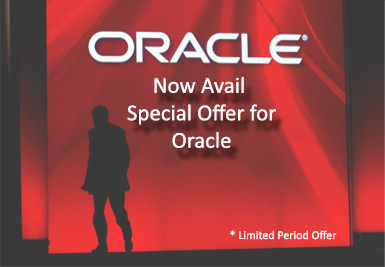 Diverse Oracle Certificate Courses offered include Oracle certified Professional (OCP), Java SE6 Programmer, Oracle Certified Expert SE6 (API Developer), Oracle Certified Expert SE6 (Web Services Developer), Oracle Certified Expert SE6 (Web Component Developer), Oracle Certified Expert SE6 (Enterprise Edition 6 Enterprise JavaBeans Developer), Oracle Certified Associate & Professional (OCA & OCP) Java SE7, Oracle Database 10g, Oracle Database 11g. Exam: 1Z0-047-Oracle Database 10g: SQL certified Expert, 1Z0-042-Oracle Database 10g: Administration I. Exam: 1Z0-043-Oracle Database 10g: Administration II. Exam: 1Z0-047-Oracle Database 10g: SQL certified Expert, 1Z0-147-PLSQL Developer Certified Associate. Exam: 1Z0-141-Oracle Forms: Build Internet Applications. Exam: 1Z0-051Oracle Database 11g: SQL certified Fundamentals I, 1Z0-052Oracle Database 11g: Administration I. Exam: Step 1: Complete one of the approved course, Step 2 : 1Z0-053-Oracle Database11g: Administration II, Step 3 : Complete the course submission Form. Exam: 1Z0-851-Java Standard Edition 6 Programmer Certified Professional. Prerequisite: OCP (SE5 OR SE6). Exam: 1Z0-898 Java Platform, Enterprise Edition 6 Java Persistence API Developer Certified Expert, 1Z0-899 Java EE 6 Web Component Developer Certified Expert Exam, 1Z0-895 Java EE 6 Enterprise JavaBeans Developer Certified Expert Exam. Exam: 1Z0-803 Java SE 7 Programmer I. Exam: 1Z0-804 Java SE 7 Programmer II. Exam: 1Z0-805 Java SE 7 Programmer.